Known best for its GPS mapping units, Garmin held a press event on Wednesday night for a product that signals its plunge into the world of cellphones. Called the nüvifone, the device at first blush is more than slightly familiar to iPhone users. A 3.5-inch wide touchscreen serves as the sole control for nearly every function; only power and volume have physical controls. 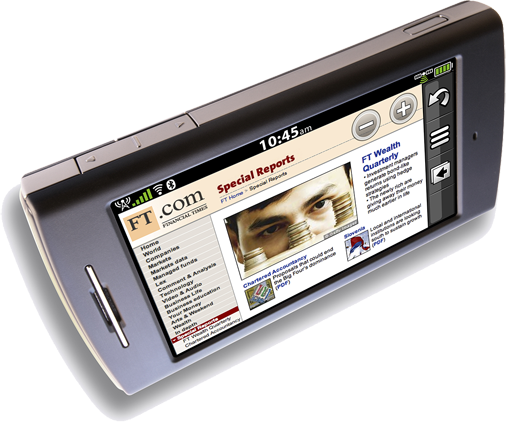 The handset will also sport Wi-Fi, an advanced web browser, and playback of AAC/MP3 audio as well as MPEG-4 video. Garmin pins its hopes, however, on one key element: a true GPS unit. 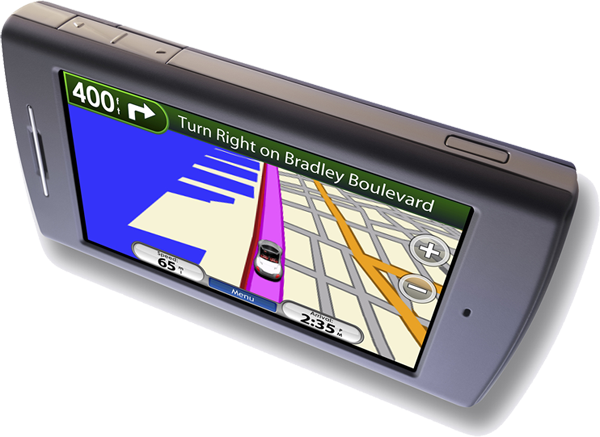 Unlike the iPhone and iPod touch, which only use triangulation to provide a rough estimate of the owner's whereabouts, the nüvifone has a true GPS receiver that pinpoint a near-exact location in North America or Europe. The tracking device supplies local Google searches for fuel prices, restaurants, and other nearby data. It will also automatically geotag (position-locate) any photos or videos captured with its camera and includes a cradle mount that switches the phone into GPS mode for use in a car. More importantly, Garmin's first phone also appears to be an answer to common complaints about its Cupertino-born challenger. Besides being able to capture video, the nüvifone runs a faster 3G cellular Internet connection and supports MMS messaging —a means of sending photos and video clips between cellphones which has been conspicuously absent from the iPhone. While potentially the iPhone's most obvious competitor to date, questions remain about the nüvifone's availability. Garmin has only promised a general summer release date and hasn't named either a carrier or a price, either of which should affect its ability to compete with Apple's current and future offerings. Fujitsu, Lenovo on tap for MacBook Air's processor? Claiming to have sources aware of future plans, CNET says that the MacBook Air's unique Core 2 Duo processor isn't exclusive and will find its way into notebooks from two major PC vendors. Both Fujitsu and Lenovo will use the 1.6GHz or 1.8GHz chips in computers that will be launched "shortly," the site alleges. As demonstrated with Apple's own design, the Intel processor is prized for an unusual chip package that reduces the size and power use of the Core 2 Duo without a severe hit to performance or having to wait for future Intel mobile platforms. Either PC maker could build a more energy-efficient notebook from the chip, the purported insiders say. Apple has a recent history of serving as the testbed for new Intel chips, including the use of Intel's first 3GHz eight-core Xeon in the Mac Pro and the 2.8GHz mobile Core 2 Extreme in the mid-2007 24-inch iMac. Many iPhone owners are cautious with their devices, but one user's mistake may ultimately help Apple sell the device for its durability, iPodNN reports. After accidentally leaving his iPhone on the trunk of his car at a gas station, owner Mike Beauchamp was surprised to learn that his iPhone not only survived a high-speed fall from the car but a run-in with a semi-trailer truck at more than 70 miles per hour on the road. Aside from a partly damaged LCD, the device is said to be completely functional down to its touchscreen, calling functions, and its camera. Even the glass "doesn't have a mark on it," the owner says. The demonstrated toughness of the phone has reportedly been enough to warrant attention from Apple itself for marketing efforts. "I've spoken with Apple's customer relations department - they're interested in using it in an iPhone commercial," Beauchamp writes. "This is the ultimate crash and durability test out there!"